From day to day, the business worldwide becomes more online and mobile oriented. The main reason for this movement is technology growth and increasing usage of internet and portable devices. The last, also, become more powerful and feature rich. So, entrepreneurs have to keep in mind and analyse lots of market and tech aspects. But today, let’s try to answer one major question. What eCommerce platform will be the best for online store owners in 2017? There are hundreds of shopping carts that provide a variety of features for shops of all sizes. But, only a few of them are popular on the internet. Those are giants like Magento, technology ninjas like WooCommerce, Shopify, BigCommerce and easy-to-use solutions like Big Cartel. So, which of them are the best, the fastest, and provides features for every entrepreneur? The answer is hidden in the infographic by Selfstartr that includes broad performance comparison of 20 eCommerce Platforms. It is clear and gives a much better understanding of the power and reliability of the major market players. Now, let’s dive into the data that is presented below and discuss it later. As you see, the results are little unexpected. 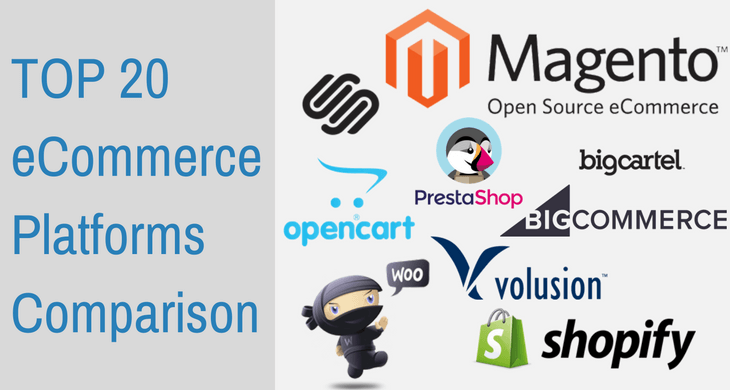 Some popular eCommerce platforms are not on the top of this comparison. But, shopping carts that are provide a particular set of features and may limit some business opportunities. That is why Magento doesn’t take the high positions in the list. But, it is a platform for huge businesses with millions of products and a full set of the unique features. So, take this data into consideration while thinking about the eCommerce platform that will meet your requirements best. But, if you choose Magento, consider hiring an experienced developer in order to customize it. Orange35 Team provides professional development and high-quality extensions for Magento during more than five years. So, if you need some customization, just submit a ticket to the Support Team and get it done without stress.